A WARSHIP which sailed into the Royal Navy’s record books after seizing £200m worth drugs in a single deployment has returned home to a hero’s welcome. HMS Dragon was greeted by an enormous crowd of more than 1,000 people as she arrived back in Portsmouth following her seven-month stint in the Middle East. During her time at sea, the Type 45 carried out carried out eight successful raids, taking an astounding 18,400kg of narcotics – more than was seized in a year by the entire UK police force. 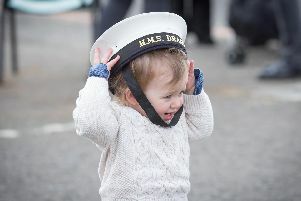 Dragon’s commanding officer Commander Michael Carter-Quinn was full of praise for his crew as they arrived back at Portsmouth Naval Base. Carrying his young son, Mark, in his arms, Cdr Carter-Quinn said: ‘It really is great to be home. It's been a long and exceptionally busy seven months. Family and friends packed into the jetty to cheer home their loved ones. Stephen Hayton was waiting for his son, Able Seaman Aaron Hayton, 21, who was part of the boarding team involved some of the raids. Engineering Technician Thomas Leah was also part of the boarding team and played a critical role in helping Dragon bag her final drugs haul – 2,540kg of hash from a fishing boat. The 21-year-old Welshman crawled underneath the boat’s fuel tanks, fighting through slime and dirt and removing false hatches to bag the narcotics. Lauren Elmer, 26, of Portsmouth, is the fiance of Leading Regulator Dave Anton, 35. She said she was glad to have Dave back. Leading Chef Steve Thewlis, of Fareham, was greeted by his wife and four children as he stepped off Dragon. HMS Dragon will now undergo routine maintenance before being deployed later this year in support of aircraft carrier HMS Queen Elizabeth.